Cue the scary music and ghost sounds, because it's time for the Halloween Lunch Box! It's a ghastly Mummy Calzone on a bed of mummy wrappings (torn paper towel), with a bucket of blood (pizza sauce) for dipping. Two gruesome shrunken heads (a baked apple with clove eyes) rise up from a swamp of blackberry applesauce, and a little paper pumpkin holds dessert. I saw this clever calzone in a Halloween recipe booklet at the grocery store. I veganized it by using my recipe for Broccoli Calzones in Vegan Lunch Box. I divided the wholegrain pizza dough into five pieces instead of eight, in order to roll out each piece and trim them into triangle shapes. 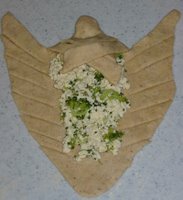 I used a pizza wheel to cut the sides into strips, then filled the center with broccoli and tofu "ricotta". I rounded the top strip of dough into a head and overlapped the dough strips all the way down to form the mummy body. Bits of black olives are the eyes. For dessert, a little pumpkin filled with candy and confetti is a nice way to make a small amount of candy feel like a very special treat. 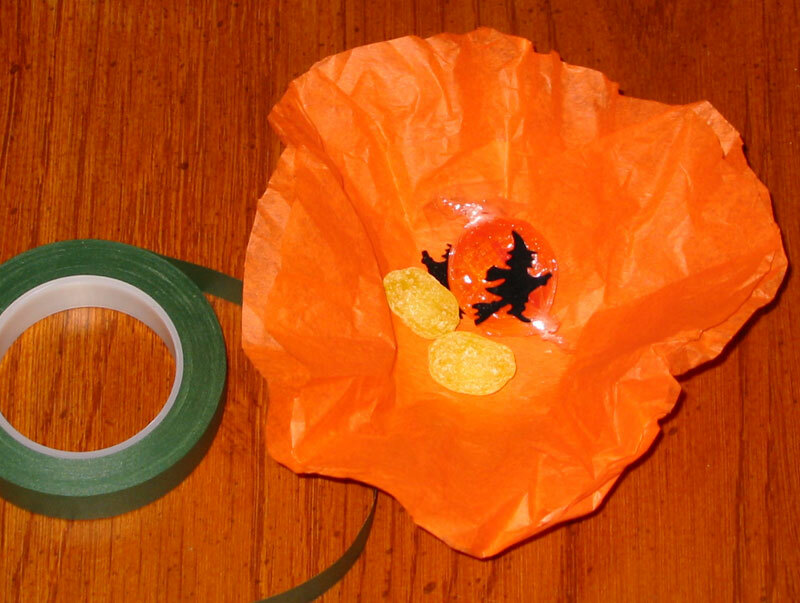 Just wrap one or two pieces of candy and some Halloween confetti or toys in a circle of orange tissue paper. Twist the top and seal with a bit of green floral tape. Verdict: "It's very important to decide whether to eat the head or feet first," shmoo informs. "I ate the head!" He was delighted by the shrunken heads. "Weird!" he says. I warned him ahead of time not to try to eat the cloves! 5 howls at the moon. This goes down as the most adorable lunchbox ever! I'm imagining the time you spent carving those apple heads--wow! Just when I was used to you making the coolest lunches ever, you go and call it "lunchbox of the damned'! Great food AND brilliant copy! I so wish you were making my lunches! Wow, great carvings! I wouldn't want it to be eaten, haha. Those shrunken heads are out of this world! May I say you are the coolest mom ever. Can't wait for the book!! This is literally the coolest lunch ever. I love the mummy calzone! How lucky Shmoo is! Amazing! Especially the mummy. I wish you were MY mom! I second (and third and fourth) all the "cool mom" posts! You're the best lunch-making mom ever! Wow, Jennifer, this is AMAZING! You'll be getting calls from Martha Stewart now I bet, asking for advice and tips! You're so talented. You are so very clever! Schmoo has the coolest lunches ever. Too too cool. What a ghoulish calzone! Am I weird for wanting to eat a mummy? 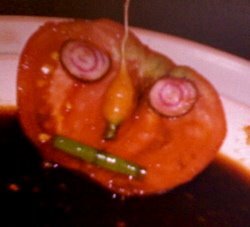 Is that vegan? ;-) Happy Halloween to you and Shmoo. I'm listening to you on Erik's Diner podcast right now. Congrats. You're so creative, this box is the coolest yet! I'm very excited to order your book. Oh my God, you are so creative!! This is for sure the coolest halloween lunch box I have ever seen!! I really can't wait to get my lunch box-book! Congrats, you are an awesome mommy!! Frighteningly delicious. Schmoo is one lucky kid. This is very cute. Well done! i wish i was eating this for dinner tonight!! what a great halloween lunch box. I agree with schmoo I would eat the head first also. I want you to make my lunches too! 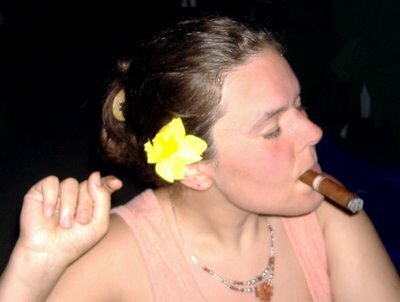 This is my first visit to your site and I'm hooked! I want to start eating all my meals out of those cute little containers. I'm buying the book on Friday. 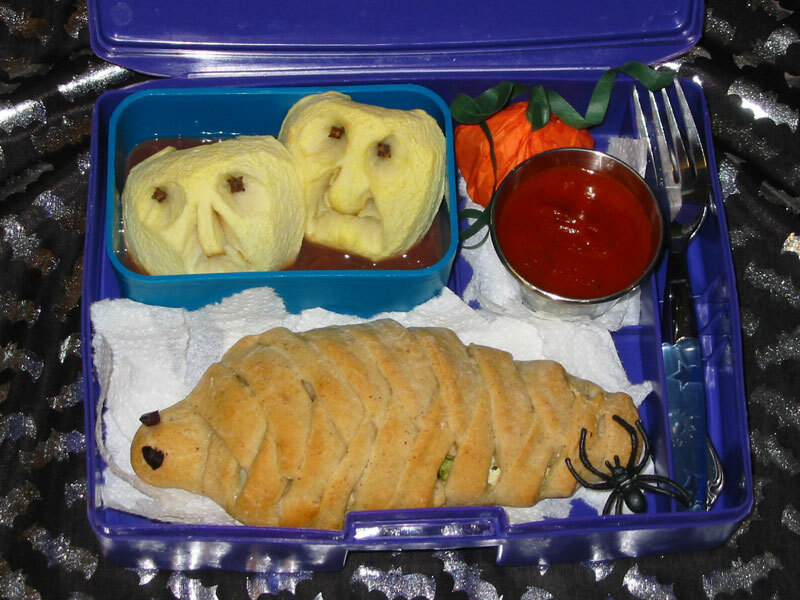 Really inventive Halloween lunch idea! 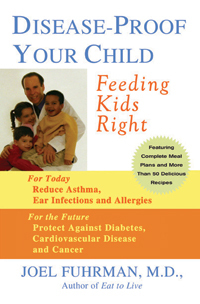 I'll be sure to check out your book for when I have little ones to pack lunches for. Oh my goodness...this is the most adorable lunchbox yet! I love the idea of the mummy calzone especially! awesome. I want you to be my mom! Oh this has to be the coolest one yet. From the title, "Lunchbox of the Damned", I was expecting some nonvegetarian's lunchbox, the sort of thing I see in the refrigerators at the worksite. 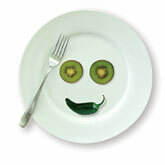 heehee ;P iM gonna try the mummy thing... iM still not vegetarian, but iM eating lots of veggies!!! it's a start!